I can’t believe it’s already May. But here we are, and we’ve logged another month of expenses. I was hoping that because we did a little less boat maintenance and ate at restaurants a little less, we’d spend less money. That was partly true, but it wasn’t the significant decrease I had hoped for. There were a few “surprise” expenses, like medicine for Yuki and new charts for Central America. Plus, food in Mexico is particularly inexpensive when compared to El Salvador, so even though we ate out less, when you look at meals eaten out + groceries, our total dollars spent on food consumption for March and April were pretty much equivalent. All in all, we spent about $2,900 in April. 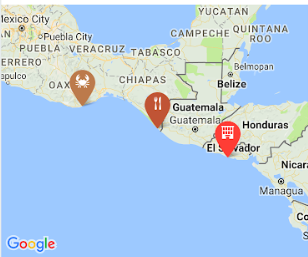 The month was split between Mexico (April 1-9), where we paid for things in pesos, and El Salvador, where they use the US dollar (April 10-30). For the purpose of this post, everything is converted to US dollars. We did make more meals on the boat, since I wasn’t reliant on café wifi all the time. Keith is with us right now, but he chips in for food too, so this amount mostly reflects food for just me and Philippe. We also hosted a couple meals for cruising friends. Not surprisingly, this marina-heavy month was costly. It’s still significantly less than rent in a San Francisco apartment, but it’s only about $300 less than what we were paying to live aboard in Alameda. A whole month at Marina Bahía del Sol in El Salvador was only $300, which is the cheapest we’ve seen (oddly, a single week puts you back $250). Sadly, we know this category is going to increase as we reach Costa Rica, which has extremely high marina fees. My guess is that Bahía del Sol offers an extremely discounted rate for the month-long marina slips because they make it all up in food. Food at the marina isn’t extremely expensive, but meals will run $10-20. They also have $1 beers, which seems cheap, but when you give Philippe and Keith dollar beers they will take full advantage. There was also an ice cream cooler, so while I didn’t drink very many beers, we all know where I spent my dollars. In contrast to the marina food, we ate pupusas in town a few times, and an expensive pupusa is $0.50. Most of these are recurring expenses: our marina insurance, mailbox service, storage unit, Netflix, etc. Folded into this category is also anything cellphone related, including SIM cards in El Salvador. Our poor pup had an ear infection in Huatulco, Mexico. Luckily, we got a recommendation for a great vet. Between the vet visit, a new health certificate, an ear cleaning solution, and an antibiotic, it wasn’t Yuki’s cheapest month. We spent $150 on new Garmin charts for our chart plotter. It feels like a lot, but it’s a necessity to make safe passages. This category also includes the $30 we spent on our zarpe to check out of Mexico and the $50 we spent to check into El Salvador. In El Salvador, the marina is pretty far from everything. We split a week-long rental car with our good friends on S/V Salt so that we could run errands in town and adventure to San Salvador. There was a fee to participate in the El Salvador Rally (but we get discounts at marinas, so this one will save us money over time). We had our laundry done. We visited Joya de Cerén, a town that was evacuated and destroyed by a volcanic eruption. I bought a new book to read (Little Fires Everywhere by Celeste Ng… I highly recommend it).